The Province and City have fully funded a new protected Cycle Track on the Claremont Access. This petition seeks to honour the memory of Jay Keddy by naming it after him. Less than 24 hours ago, shortly after this Hamilton Spectator article, I created this petition after checking with Keddy's surviving family. I first suggested this back in 2015 in an RTH comment. The new petition received 500 signatures in its first 24 hours and has already surpassed 1,000 signatures. We want to name the new protected cycle track on the Claremont Accesss the Keddy Access Trail (KAT) or another similar name (Keddy Trail, Keddy Route) in memory of school teacher Jay Keddy. Jay Keddy, 53, was killed in December 2015 while legally riding his bicycle up the Claremont Access in Hamilton, Ontario, Canada. The province and city have fully funded the cost of the new Claremont Multi-Use Trail that begins construction in 2019. This is a new safe walking & biking route between Hamilton Mountain and Lower City. The Claremont Trail planning drawings [PDF] include concrete barrier protection to protect pedestrians and cyclists from motor traffic. It has many midpoint connections to Southam Park, Escarpment Rail Trail, Arkledun Avenue, John Street, St. Joseph, and extension to Mohawk College. On May 1, 2018, Allastair, the son of departed Jay Keddy, tweeted his family's blessing for this initiative, to dedicate the trail in honour of Jay Keddy. Please sign this petition to let City of Hamilton we want to name the new Multi-Use Trail after Jay Keddy. "Jay Keddy is my big brother and it would keep his legacy alive and help other cyclist to be safer and get home alive !" "Jay Keddy was such an example of loving people of every race and ethnicity. He wasn't a giant in the eyes of the famous as we know it but he was a giant in his gracious and gentle spirit. He influenced so many people, young and old. It would be such a tribute to honour Jay in this way"
"Mr Keddy was my son's kindergarten teacher. The accident happened the second year of being in his class. We enjoyed our time with him and miss him dearly. My son always thinks of him when we go up the Clairemont. Points to where the ghost bike use to be and then talks about him. He was a very involved teacher and very nice. Would be truly amazing to have the trail named after him." "Jay dedicated himself to making life better for all who came in contact with him; he was loved, respected, and admired by people from all walks of life. Naming the trail after him would be a great way to honour his memory." "I remember going up and down that access in Grade 13, and it was pretty scary"
"Jay meant a lot to a lot of people and having his name live on with this trail would be beautiful ❤"
The new Multi-Use Trail represents inclusive infrastructure that safely accommodates pedestrians and cyclists, and includes both Mountain and Lower City. If Hamilton strives to be a good place to raise a child — including those who were in Keddy's classes — this is an important year to let all our representatives know we want safe infrastructure for our children. Jay Keddy's legacy is a very honourable way of communicating this. Sign the petition now - it takes only five seconds - and share too. Jay Keddy's son, Allastair, is currenty sharing our petition on Facebook and on Twitter. Mark Rejhon lives in Hamilton Ward 3. An IT software developer, home-owner, car-owner, bike-owner, SoBi bike-share user, public transit user, and GO user, he is a big-time advocate for improved transit. Mark frequently tweets about #hamont and transportation at @MDRejhon and leads the Hamilton LRT Advocacy run by local residents. Spouse of Alain Bureau, candidate for Ward 3 city councillor in the 2018 Hamilton municipal election, @ABureauWard3. Is the city still accepting comments on the trail design? I would have loved if there was a spur accross the South side of the Arkledon bridge to connect with stairs to Sam Lawrence Park. That's our most beautiful park IMO, and it's a shame the only pedestrian path there from the lower city involves a winding route across the mountain from Southam Park. There's an earlier RTH article with concept drawings. There were city public consultations which I attended. There's an email address there that you can reach out to. One of the most popular comment was that there should not be a stop sign at the bottom, and that the trail should stay on the same side to contiguously connect to the Hunter cycle track. There is a separate project planned to extend the existing Hunter cycle track to the GO station, so -- apparently -- that means fully protected cycle infrastructure all the way from Mohawk College to the GO station. This is a good memorial to Jay Keddy. But let us not forget that for every person in Hamilton who is crushed and killed by motor vehicle operators, there are over five people who are poisoned and killed by motor vehicle operators. Where is their memorial? I feel that naming the Multi-Use Trail after Jay Keddy also helps towards this because, as this is an uninterrupted pedestrian & cyclist infrastructure between Hamilton Downtown and Mountain's Mohawk College. An institution full of Hamilton's Next Generation, some of who may choose to use the Trail instead of driving to Mohawk College, thanks to these initiatives. Since the planned Trail is along the brow edge of the Claremont, this provides great views of the environment part of the way, and increases appreciation for cleaner air, too. With the Trail naming, many teachable moments, of Keddy's teacher legacy and improved Mohawk connection. These are only small moves, but very important. This inclusive infrastructure also connects to Hunter cycle track, which leads to the GO station that will get all-day 2-way GO service to Toronto by 2025, and will also include a new cycle path extension to fill in the broken-segments of Hunter. There's many mid-point connections Likewise, on the Mountain, the Claremont Multi-Use Trail will connect to Mohawk College via an extended Multi-Use Trail reaches St. Joseph Hospital and Mohawk College. Several of us can enjoy or tolerate a walk up/down a long slope but are completely unable to comfortably handle the (otherwise great) Hamilton Stairs such as knee difficulties, vertigo/balancing issue, health, arthritis or age. Understandably, not everyone can handle it, but more will be able to than having only stairs/motor options. While it is person dependant; this Multi-Use Trail is an additional option can reduce the fear of being fully reliant on vehicular transportation in both directions & mercy of always ride scheduling both ways -- as options in addition to HSR, to Mountain Climber, to DARTS. 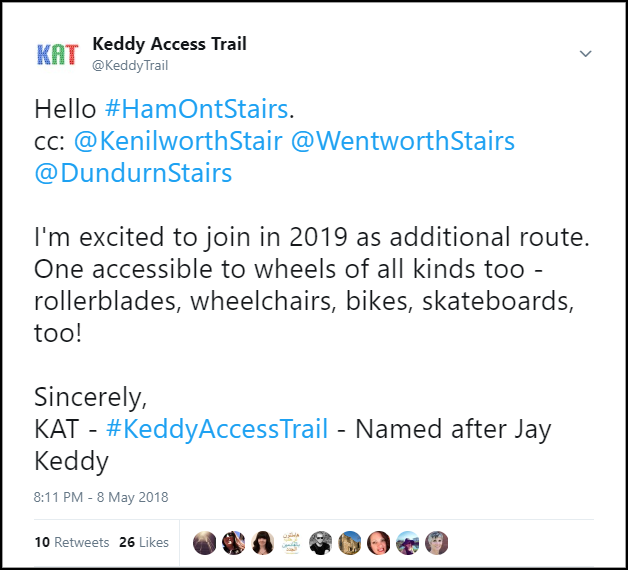 In putting "Access" in Keddy Access Trail, this is in line with the spirit of Keddy's nature of inclusivity told by many ( small excerpts in in this twitter thread ). With mother road being the Claremont Access, the Keddy Access Trail is born from this route. This is great name recognition advertising for a trail that will soon exist in Hamilton's landscape, Keddy's namesake increased awareness leads to increased use. The naming dedication also increases the odds one will take the trail more often than instead of always being car-reliant every single trip. And that is very good for our health too. "Let's go on the Keddy"
Several of us feel that the name recognition is memorable with Keddy Access Trail. It is a great community brand for clean inclusive way of transportation, while being respectful with Keddy's spirit. There are many teachable moments from this. All of this, helps keep Hamilton on the right path. Any electoral candidate thinking of trying to delay/cancel the Multi-Use Trail, is faced with the unsavory prospect of answering to this petition. This powerful symbolism, illustrates a good irreversible goal towards keeping Hamilton's air cleaner, by dedicating infrastructure that is pedestrian-friendly and cycle-friendly between Downtown and Mountain. I think that the Kevin Love that I am familiar with (of Cycle Hamilton) would probably agree with that too; this petition essentially makes this plan irreversible. We must also address other opportunities too as well; in parallel to this. The south end of the trail ends at Brantdale Ave, after which there is no bike lanes, thanks to Terry Whitehead. Are there plans for this? The Trail is fully funded with provincial government matching funds. And a considerable amount of money has already been spent on design work. Of course, a future City Council can delay or cancel it, but I would consider that highly unlikely. Indeed, I do. And I am the person who signed the petition, because I agree with the petition. One thing leads to another. As an Army veteran, I can see how memorializing the dead leads to "Never Again!" as the slogan for preventing further deaths. Just in -- Terry Whitehead is the one bringing a motion on Wendesday May 9th to name the Claremont trail after Jay Keddy. Let's see if we can get a comment from Terry about this part? Very anecdotally and unconfirmed, but I believe I heard there were additional (separate) plans for this segment, just like I also heard additional (separate) plans to complete the other end (broken segments of Hunter Cycle Track to Hamilton GO station). If both separate plans are also true, that represents a nonstop continuous protected connection. True -- that said, there's also several other spinoffs funded from different funds. Like the completion of the Hunter cycle track through the GO station. The various future connections and extensions, like further up West 5th into Mohawk College. Integration to better pedestrian and cycle integration too becomes part of the conversation of the Keddy Access Trail. I've put together a montage of the Keddy Access Trail. Observe that it includes a large number of mid-point connections. Contrary to some headlines, it is not "Just a Bike Lane", it is a fully inclusive MULTI-USE TRAIL -- safely protected by concrete barrier -- accessible to all who is able to handle the slope, wheelchairs, skateboarders, pedestrians, rollerbladers, cyclists, etc. Includes many mid-connections as observed in this diagram! With over 1600 signatures, one of City Hall's most no-brainer moments if this passes very quickly as recognition of this important infrastructure addition. EDIT: Tune to CHCH TV at 6pm. Exclusive television interview with Allastair Keddy, myself and Alain H Bureau (Wed May 8th at 6:00pm). After 1700 signatures, the city council motion, brought forth by Terry Whitehead, has passed unanimously. All standing. "The name is offical -- Keddy Access Trail (KAT)"
"Unanimous vote today by City Council to name the new Claremont Multi-Use Trail after Jay Keddy. The name that was approved is "Keddy Access Trail"
Now, @KeddyTrail wants to say hello.